This is an ex-library book and may have the usual library/used-book markings inside. This book has soft covers. In good all round condition. Library sticker on front cover. Large print. Good condition book. Minor Shelfwear. Good condition is defined as: a copy that has been read but remains in clean condition. All of the pages are intact and the cover is intact and the spine may show signs of wear. The book may have minor markings which are not specifically mentioned. Most items will be dispatched the same or the next working day. Very good. Some slight wear to the cover. 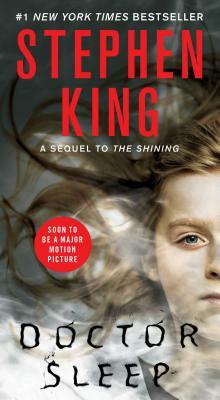 Epic sequel to "The Shining"
Picks up in aftermath of the horrific events that took place at the Overlook Hotel. As Danny Torrance, now Dan, grows older and tries to deal with his "gift", he becomes an alcoholic with anger issues. (Just like his Dad). He roams from town to town picking up odd jobs, often as an orderly in nursing homes. When his problems cause him to lose a job, he moves on. Eventually, some 35 years hence, he ends up in Frazier, New Hampshire where he decides to quit drinking and joins AA. He gets a job at a hospice and uses his gift of the "shine" to help dying patients pass over. Thus becoming known as "Doctor Sleep". He gets connected with a young girl. a wonderful character named Abra Stone who has a "shining" even more powerful than his. Meanwhile, there's a group a quasi-vampires, the True Knot, who roam the country and feed off the "steam" or essence of children with the "shining" that they torture to make the "steam" more powerful. The story twists and turns (with one goose-bumpingly, jaw-dropping moment) to an epic confrontation.